Home / About Autism / Adults with Autism / How does the Autism Brain Change through the Lifespan? Autism spectrum disorder (ASD) is generally a lifelong condition, but there is currently very little understanding of how the brain changes in people with ASD as they age. One researcher who is focusing on changes in the brain in people with autism during development is Dr. Cyndi Schumann at the UC Davis MIND Institute. Dr. Schumann has carried out magnetic resonance imaging studies on people with autism as well as microscopic studies on postmortem tissue for multiple age groups to describe the different phases of brain development in those with ASD.1 When her team looked specifically at the amygdala, a brain region responsible for processing emotional information, they found that changes depended on the age studied. 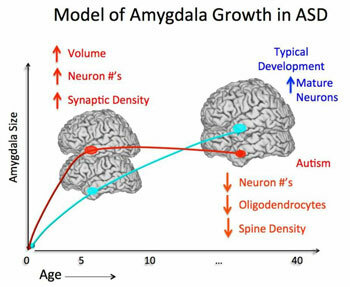 As you can see from the drawing below, there is a phase of early amygdala overgrowth in ASD followed, at later ages, by a decrease in neurons. What causes this alteration in the trajectory of amygdala growth is not known but may have profound effects on the behavior of individuals with ASD. A more recent study from the Institute for Basic Research in Developmental Disabilities in New York examined the cell structure, size, and shape of the brains of individuals with ASD. The researchers agreed with amygdala growth theory in principle, but added some details.2 They demonstrated that different brain regions showed these differences more profoundly than others. These brain regions include the cerebellum, which contributes to the execution of complex motor movements; the nucleus accumbens, which is associated with motivation and reward for behaviors including social interaction; and the amygdala. This might explain the specific behavioral features seen in ASD. These findings may not just be limited to autism-related pathology and autism symptoms. Early findings, which need to be replicated, reported an increase in the Alzheimer’s disease-associated protein, Amyloid beta, in some individuals with autism.3 This is the protein that leads to the plaques and tangles associated with Alzheimer’s symptoms. While the link between Alzheimer’s disease and autism has not been determined, the presence of this protein in the brains of people with autism may signal early signs and symptoms. These types of studies need to be larger and include carefully selected samples. 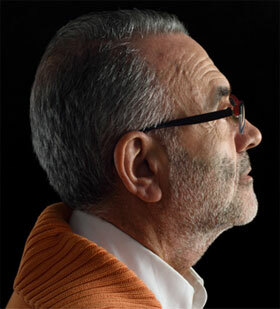 Along these lines, using a clinical cohort, researchers at The University of North Carolina, at Chapel Hill reported an increased risk for later symptoms of Parkinson’s disease in individuals with ASD.4 This indicates that the very early changes in cell size, shape, and function associated with ASD may have long lasting consequences. ASD is a lifelong condition and this knowledge highlights the need for services and support at all stages of life. Research studies like these need your help. 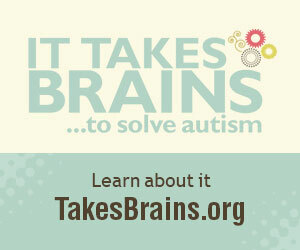 To learn more about the Autism BrainNet and to receive more information about why it takes brains to understand autism, go to www.takesbrains.org/signup. Morgan JT, Barger N, Amaral DG, Schumann CM. Stereological study of amygdala glial populations in adolescents and adults with autism spectrum disorder. PloS one. 2014;9(10):e110356. Wegiel J, Flory M, Kuchna I, et al. Brain-region-specific alterations of the trajectories of neuronal volume growth throughout the lifespan in autism. Acta neuropathologica communications. 2014;2:28. Wegiel J, Frackowiak J, Mazur-Kolecka B, et al. Abnormal intracellular accumulation and extracellular Abeta deposition in idiopathic and Dup15q11.2-q13 autism spectrum disorders. PloS one. 2012;7(5):e35414. Starkstein S, Gellar S, Parlier M, Payne L, Piven J. High rates of parkinsonism in adults with autism. J Neurodev Disord. 2015;7(1):29.